Andy B Events are pleased to be working with Popwork! Excellent 4 pc party band, performing live music that spans from the 60’s to the present day, they are the perfect encouragement for your guests to get down (or up) and boogie! 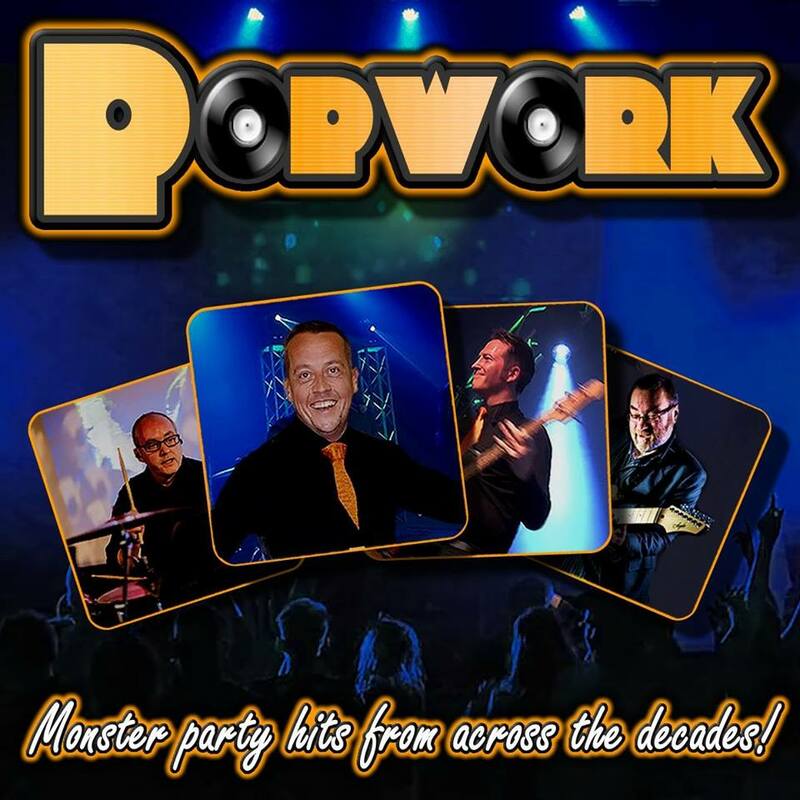 Popwork cover all the monster hits from Kings of Leon, Bruno Mars, Maroon 5, Daft Punk, Pharrell Williams, Olly Murs, The Black Eyed Peas, The Scissor Sisters, Cee Lo Green, Bon Jovi, Guns n Roses, Stevie Wonder, Michael Jackson, Take That, Queen, Wham, KC and The Sunshine Band and many more. And as if that isn’t enough to provide you with everything you could want from a party band, they will even change their set list to suit your occasion! The band have played at hundreds of weddings, corporate events and private parties throughout the years. Having worked hard to gain a reputation for being one of the UK’s leading party bands, Popwork work tirelessly to ensure that each and every show is as good, if not better than their last. As you might expect, playing to so many varieties of audiences would call for varied genres of music. Popwork cater for all age groups and tastes by mixing up their standard set lists with material from their extensive back-catalogue for the benefit of a mixed-age event like a wedding, birthday party or outdoor festival. There is a lot of pressure on anyone organizing a wedding or corporate event, to find a perfect band that guarantees both an incredible night of live music, as well as a full dance floor from start to finish. It is also increasingly hard to find a band that are happy to adapt their performance to suit your musical tastes and preferences. This is why Popwork are so often the band of choice. They pride themselves on their attention to detail, adaptability, professionalism and dedication, but what makes them really special is the magic that happens on stage. Popwork can also theme the show to suit your night. Options available are 70s, 80s or Glam.